The "life cycle" theory of consumption and saving was pioneered by Franco Modigliani, winner of the 1985 Nobel Prize in economics. The theory is a common model used by economists to describe people's overall saving and spending behaviors. Most people's lifetime income follows a hump-shaped pattern: Income is lower when they are young, income rises (and peaks) during middle age, and income falls again during retirement. If consumption matched income, then consumption would have a hump shape as well. That is, people would consume few goods and services when they are young, consume a great deal when middle aged, and again consume very little after they retire. However, in reality, most people prefer a smoother consumption pattern over their lives, as shown in the first figure. NOTE: The life cycle theory of savings suggests that people prefer smooth consumption over their lifetime. Workers can smooth their consumption by borrowing while they are young, saving in middle age, and "dissaving" during retirement. When people are young, they make up the difference between their preferred consumption and their relatively low income by borrowing. For example, this allows (i) students to go to college using college loans and (ii) new workers in the labor force to buy housing using mortgage loans. 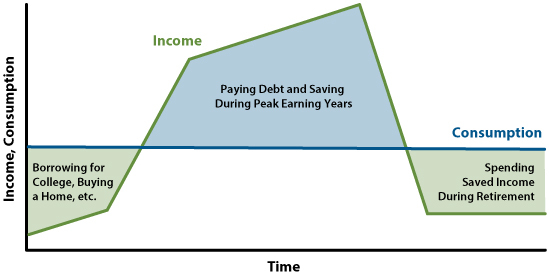 During middle age, income rises above preferred consumption, and the model suggests that people limit current consumption to pay off student loans and mortgage debt (among other debt) and save for retirement; this is the accumulation or saving phase. During retirement, when income falls, people dissave by spending their retirement savings. Thus, both borrowing and saving help smooth consumption over time. While Social Security can provide a foundation of retirement income for many people, in order to have smooth consumption, the life cycle model assumes people save for retirement during their earning years. Many people think of saving as money deposited in a savings account, but saving is simply money not spent on current consumption or taxes. People can save by leaving money in a drawer, depositing in a savings account, or investing in stocks and bonds. It may be helpful to think of saving as giving up some current consumption in exchange for future consumption—in other words, saved money is set aside for future spending. This implies there is a trade-off—more saving requires less spending on current consumption. Saving allows people to have higher future consumption. NOTE: The personal saving rate, currently 5.4 percent, has increased slightly since the period immediately preceding the Great Recession (2007-09) but is still lower than the historical average of 8.4 percent since 1959. The gray bars indicate recessions as determined by the National Bureau of Economic Research. SOURCE: Federal Reserve Bank of St. Louis FRED®; http://research.stlouisfed.org/fred2/graph/?g=IV7. Workers can often save for retirement through their employer, typically through a defined benefit retirement plan (also known as a pension plan) and/or a defined contribution plan (such as a 401(k) plan). 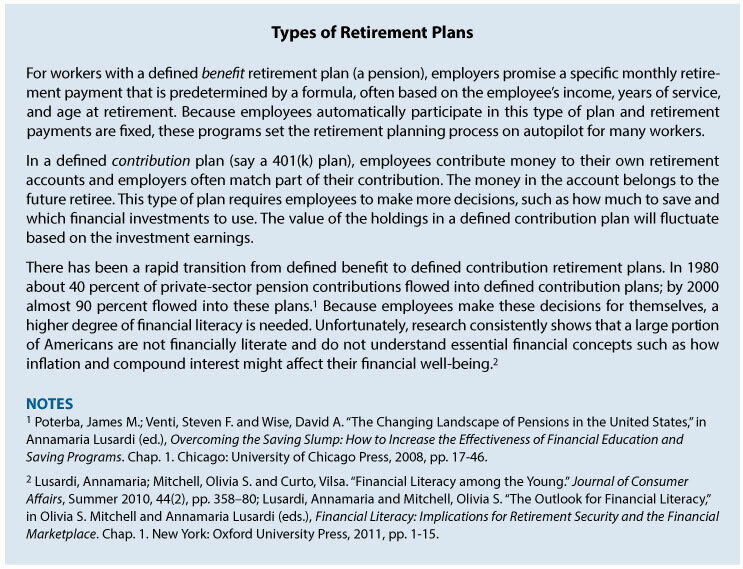 (See the "Types of Retirement Plans" boxed insert.) However, employees make more decisions with defined contribution plans, which requires more financial knowledge (see "The Importance of Financial Literacy" boxed insert). When employees retire (unless they buy an annuity), they themselves decide how quickly to spend the money accumulated in the account. If they draw down the account too quickly, they risk outliving their retirement savings. The life cycle model shows that saving for the future requires people to limit consumption during their working years and save so they will have a "nest egg" to draw on during retirement. Recent changes in how people save for retirement have shifted some responsibility from firms to individuals. Unfortunately, households are not saving enough for retirement. Two lessons emerge: Saving while young is important, and making the right savings and consumption decisions makes a difference. 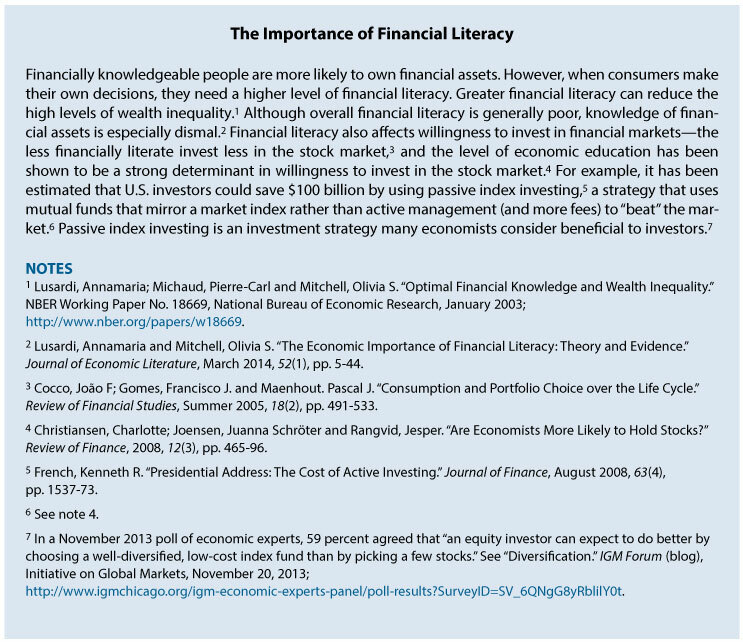 Financial literacy has always been important to achieve these financial goals, and its importance seems to be growing. 4 Venti, Steven F. and Wise, David A. "The Cause of Wealth Dispersion at Retirement: Choice or Chance?" American Economic Review, May 1998, 88(2), pp. 185-91. 5 Those who do not understand the exponential nature of compound interest tend to borrow more and save less. For more information, see Stango, Victor and Zinman, Jonathan. "Exponential Growth Bias and Household Finance." Journal of Finance, December 2009, 64(6), pp. 2807-49. Compound interest: Interest computed on the sum of the original principal and accrued interest. Dissaving: To consume more than income; essentially, the opposite of saving. Saving: Not spending on current consumption or taxes. Saving involves giving up some current consumption for future consumption. Trade-off: Giving up some of one thing in order to gain some of something else.